Automatic coffee machines might not be the best way to make your coffee, and dedicated coffee-enthusiast and baristas often frown upon that idea and vote for pour over or French press instead. However, no one can argue at the fact that automated brewing devices are the most convenient, and Keurig coffee makers are the best among such coffee makers. What to Look for When Buying a Keurig Coffee Maker? Instructions: How to Use a Keurig Coffee Maker? We have a few good reasons. First of all, Keurig is a well-known, renowned company that vouches for its products. Keurig coffee makers come in all price ranges as well as an array of different colors and designs to complement your home decor. Most importantly, these reliable machines will guarantee not only convenience and speed but also consistent results: a great tasting cup of coffee. Moreover, you will be able to choose among 160 different flavors so you are bound to find at least a few that will match your personal taste in coffee! Finally, Keurig coffee makers do not call for tiresome maintenance, quite the opposite- they are easy to clean and care for. Do you want to buy a Keurig but cannot decide? Indeed, Keurig coffee makers come in a bewildering range of models, but we have made a choice easy! 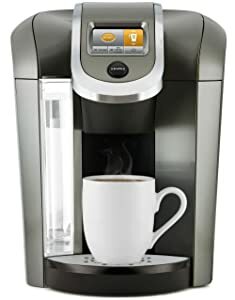 Read on to learn all about ten best Keurig coffee makers in 2019 and then simply choose the one that best suits your needs. 4, 6, 8, 10, 12oz. K-Mug Pod brew sizes: 12, 14, 16, 18 oz. K-Carafe Pod brew sizes: 22, 26, 30 oz. Since their immersion in the market, K-cups reached huge popularity on the market, selling millions of their products. Their company policy was based around the fact that people want quick, accessible, and easy-to-make coffee. What’s the difference between K-cups & pods? K-cups and pods are not interchangeable, and most machines will not work with both. A pod is coffee sealed in a filter paper while k-cup is coffee sealed in a plastic cup with paper filter included. If you are worried about the environment, this might be an important issue. The plastic used in manufacturing K-Cups was not biodegradable for a while, and not reusable, creating a lot of plastic waste which impacts the environment on a large scale. The inventor of Keurig admitted himself that he was not “even dreaming of such growth” and influence on the market. During the last years, Keuring has improved their product, bringing us better quality materials and reusable cups. While speaking of waste, new generations of K-cups are built with completely biodegradable materials, impacting the environment in a huge way. With these K-cups, you can enjoy your perfect coffee without feeling guilty! It comes in several nightlight colors which will illuminate your kitchen. The 80 oz water tank capacity allows you to serve up to ten cups before a refill. You can adjust the cup size as well as control the strength of your beverage. People often compare Keurig K475 vs K575, and differences are display, water reservoir, nightlight, & customizable wallpaper, all in favor of K575. The unit is programmable allowing you to organize your time better. It is super easy to use thanks to a 2.8-inch full color, touchscreen control panel. Fits mugs up to seven inches high. The Keurig K55 is one of the most popular Keurig’s models. This model measures 13.3” H x 10.1” W x 13.2” Dand features a generous 48-ounce water tank for you to prepare up to 6 cups on a single fill. The tank is easily removable for refilling and cleaning purposes. 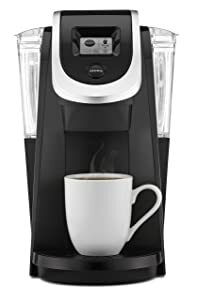 This coffee maker is compatible with 6, 8, and 10-ounce K-cup pods and thus you can choose differently sized cups for Keurig K55. The great news is that you get 4 K-cups plus two free water filters to kick start your coffee addiction. It is available in four colors: black, blue, white and rhubarb. The Keurig K145 is designed for office use, but you can use it wherever you like as long as it suits your needs. It measures 12"H x 9"W x 11"D. This unit is very versatile and can brew an array of drinks besides plain old coffee including hot and iced tea and hot chocolate. K145 is compatible with the three most common cup sizes (6, 8 and 10-ounce) and comes with a 48-ounce water reservoir. The unit is super easy to clean due to the self-draining tank. The auto-off functions save energy as it automatically cuts off power after two hours of non-use. No need to track the cleaning routine as K145 comes equipped with descaling beamer to notify you when the machine needs cleaning or descaling. On the downside, the unit is a bit noisy. Keurig K15 might be mini, but when it comes to colors, it offers an array of vibrant options to choose from (Black, Burnt orange, Chilli red, Denim blue, Greenery, Oasis, and Platinum). The unit measures 10.8 X 6.9 W X 10.7 D which makes it suitable for small kitchens. It can brew a great coffee for any cup (6, 8 and 10 oz) and fits any mug up to 5.2” tall. If you happen to forget a mug, no worries it will hold up to one accidental brew and prevent a mess in your kitchen. Single cup water tank might not be the best solution for some of you, but at least water will be fresh each time. K15 can brew not only coffee but also tea, hot cocoa, and iced beverages in under two minutes. It is not only super easy to use but also turns off on its own if you leave it inactive for more than 90 seconds. 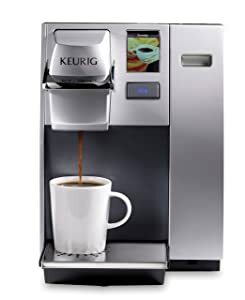 Keurig K155 is another model designated for office use. With the whopping 90 oz water tank capacity it can serve up to incredible 18 cups per fill making it great for busy working environments. As a bonus, the reservoir is easy to clean as it is both removable and drainable. You can set this unit to fit four cup sizes (4, 6, 8, 10 oz.) as well as choose the strength of your beverage thanks to the strength control setting. Measuring 14 x 10.4 x 13.8 inches it is rather compact for its capacity. You will have no trouble using this unit thanks to the advanced full-color touchscreen interface. You can adjust the brew temperature and program the auto On/Off feature. The Keurig K475 is designed for home users as well as budget friendly. It comes in two colors –traditional Black and interesting eye-popping Vintage red. The LCD touchscreen allows you to choose between five cup sizes (4, 6, 8, 10, or 12 ounces) as well as three carafe sizes (22, 26, or 30 ounces), plus you have five different temperature setting and strength adjustment feature. The water tank capacity of 70 oz makes it more than suitable for even the largest households. The auto on and off feature saves power and allows you to plan your day better. 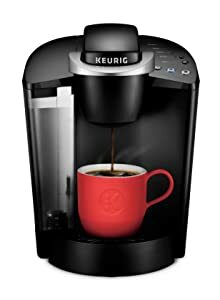 The unit uses only Keurig pods, but you can choose between K-mug, K-cup, and K-carafe pods according to your current needs. 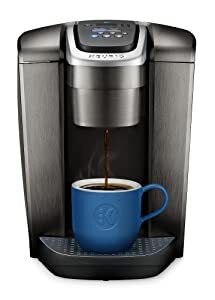 Choose an ideal color of your Keurig K250; it comes in Imperial Red, Oasis, Peacock blue, Plum grey, Sandy Perl, Turquoise, and of course Black. Besides great design K250 comes with useful settings such as the Strength Control and easy to operate touchscreen. This model has a 40-ounce water tank that can produce up to 6 regular size cups of coffee without a refill. The water tank can be easily detached when needed. The water level window lets you know when it is time to pour in more water. 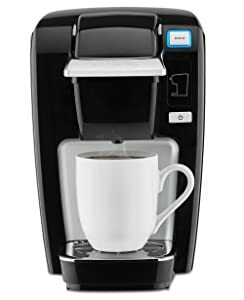 Often comparison that you can read online is Keurig K200 vs K250 - which brings the difference of water filter, descaling solution, & brewing time, all in favor of K250. You have quite a few options when it comes to cup size (4, 6, 8, and 10-ounce) but you can also choose between K-cup sizes, K-mugs, and K-carafe of up to 30-ounces. Unfortunately, you need to buy the carafe first. Keurig B70 Platinum is yet another sleek looking coffee maker that has a durable stainless steel construction. It is super easy to operate due to the one-touch control panel and blue backlit LCD display. Blue lights are especially attractive at nighttime. It allows you to choose between five different cup sizes (4 oz., 6 oz. 8 oz. 10 oz. and 12 oz travel mug). You can program the auto on and off function as well as the digital clock and adjust the brew temperature for best tasting beverage. The removable drip tray makes this compact unit (13-4/5 by 10-2/7 by 13 inches) easy to clean, while the blue-lit, easy to remove 60 oz water tank can even be washed in your dishwasher machine. Descale indicator will let you know when it is time to perform this important operation as well. 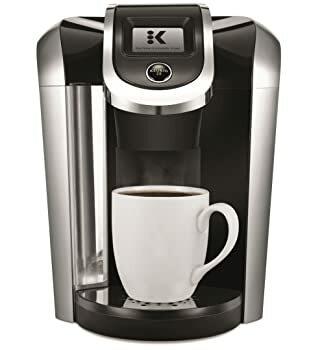 Keurig K525C comes with a reusable My K-Cup that enables you to use ground coffee with this coffee maker and not only K-Cup pods. Although it is K-carafe compatible, it does not come with the actual K-carafe and you have to buy it if you wish to use this possibility. Although it might seem a bit pricey, this model comes with numerous extra features well worth the money. 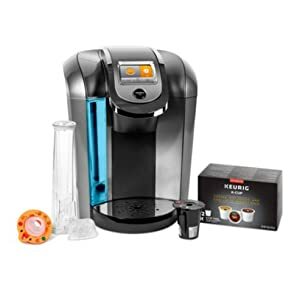 Besides the strength and temperature control, the greatest number of the brew size options, hot water on demand, and allowing you to brew your own ground coffee, you will also receive a 12 count K-Cup pod variety pack. 2.8” Color Touch Display is super easy to work with, you can even customize the touchscreen color. Auto on and off feature helps save energy and let you program the unit for utmost convenience. Keurig K-Elite is a true work of art. 20-years of experience produced this premium coffee maker that is not only elegant looking but also efficient and reliable. The removable 75 oz water tank is sure to fit your needs while the easy controls have taken all the guesswork out of making your preferred beverage. There is even a dedicated iced coffee button! The integrated clock is a great addition but you also have features such as Auto On and Auto Off, Smart Start feature and strength and temperature control. It measures 13.1"H x 9.9"W x 12.7"D and comes with five brew sizes to choose from. It comes in three colors brushed silver, gold, and slate, but no matter which one you choose your kitchen is bound to look more elegant! Keurig is definitely a good choice, but not all Keurig coffee makers are the same. 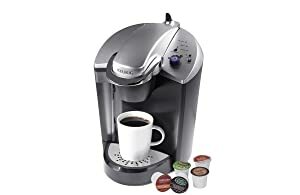 So, what should you pay special attention to when searching for a Keurig so that you are sure you have truly picked the best Keurig coffee maker among them all? Keurig coffee makers come with water tanks with a capacity that ranges from 40oz to 80oz. It is not a small difference you will agree, and thus you should think about your needs and coffee making habits before you decide on this matter. Consider how many cups of coffee you are going to make each day as you do not want for water to sit in the tank for too long- it does not only go stale but leaves residue as well. The best Keurig coffee maker needs to have an array of options to adjust the cup size. In this way, you will be able to make a perfect single cup for anyone. 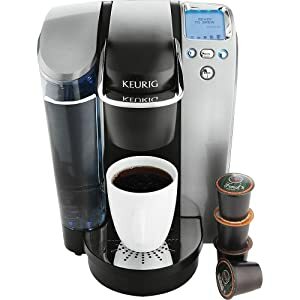 The best Keurig coffee maker will also have the Strong option that will allow you to make your coffee extra strong if you prefer it that way. Keurig machines come with various additional features including the option to activate the auto on-off feature. In this way, you will be able to programme your coffee maker to automatically switch on at a certain time and brew your favorite coffee. Imagine waking up for your work, and your coffee already awaits for you. ; this feature can make that become your everyday reality. Auto-off feature is also a safety bonus. Brewing time differs from Keurig from Keurig. Therefore, if you do not want to spend more time than you desire to wait for your coffee to come out ready, make sure you get informed on the speed of brew before you buy your coffee maker. Automatized coffee makers are made to make your life easy, so there should not be too much trouble using them, after all, they all come with a manual, don't they? Make sure you plug it in and turn on the power ( most of the time the power button is located on the top right side). Fill in the water tank. If you hear gurgling, do not worry the machine is pulling the water into the heating chamber. Choose the coffee ( or desired K-cup) and insert it into the machine (there is a designated spot on each machine. Refer to your manual to locate it). Make sure that the coffee chamber is well closed. Place the coffee mug onto the appropriate tray making sure that the size is right. Your coffee is ready, but before you go off to enjoy it remember to remove the used K-cup or clean the coffee chamber. Leave the chamber opened between uses. Cleaning and descaling processes are similar and share the same purpose - to ensure your coffee maker operate to its best possibilities, lasts longer and produces the best coffee it possibly can. However, these processes are not the same, and thus single-serve Keurig coffee makers need to be both cleaned and descaled regularly. Cleaning will remove the oily residue while descaling will break down the mineral scale on the heating element and extend the life of your Keurig. Based on the trouble you’re dealing with, you should either contact Keurig support team or educate yourself on how to solve these problems and get spare parts. We dig deep into this topic here. How do You Reset a Keurig Coffee Maker? Remove the water reservoir, turn off the coffee maker, unplug it for several minutes. Plug in the machine, turn on the power and then replace the tank. Can You Use Vinegar to Clean Your Keurig Coffee Maker? Yes. Mix half water half vinegar and pour that into the water tank. Let the machine run its cycle and then repeat the process with water only. Can You Make Expresso in a Keurig? In general, Keurig coffee makers are designed to brew drip coffee not make espresso. However, there is a great Keurig espresso maker on the market: the Keurig Rivo which is specifically designed to make espresso drinks. Can You Make Cappuccino in a Keurig? Some newer models of Keurig coffee makers have the capability to make cappuccinos quickly and conveniently. After everything we went over in this article, we can say with confidence that we’re now experienced, knowledgeable Keurig enthusiast. Having an educated guess on best Keurig coffee maker is quite easier now. And the main point is - it all comes down to your preferences. It depends on how many cups of coffee you want to have ready at disposal, the mechanism, the filters, speed, and alternating the options. For us, Keurig K575 Platinum ticks all the boxes. Many won’t regret getting it.